Les Alchimistes – Saumur, 6 rue de Lorraine (02.41.67.65.18). Open 12.15-1.30pm, 7.30-9pm Mon, Tue, Thur-Sat; 12.15-1.30pm Sun. €€. As the restaurant’s name suggests, chef François Deplagne and his wife Lydie are culinary alchemists, serving delicious gourmet food at unbeatable prices. The €17.50 three-course set menu is a feast of local dishes reworked with a modern twist – pike-perch with beetroot butter, hare in red wine sauce, bitter chocolate mousse with orange sorbet – all made with seasonal ingredients fresh from the market. A la carte dishes might include terrine of foie gras and langoustines served with curried apple chutney, grilled Charolais beef with walnuts, and caramelised fruit tiramisu. Au Chapeau Rouge – Chinon, 49 pl du Général de Gaulle (02.47.98.08.08/ www.auchapeaurouge.fr). Open noon-1.15pm, 7.30-9pm Tue-Sat; noon-1.15pm Sun. Closed 3wks Nov & 3wks Feb. €€€€. The Red Hat (named after the hats worn by the royal post carriage drivers) is one of Chinon’s finest restaurants. Chef Christophe Duguin gives pride of place to locally grown, seasonal produce, and the menu might include starters like duo of home-smoked, Loire-caught fish served with lime cream, followed by mains like lamb steak roasted with dried fruits and served with wine-soaked rillons. To finish, maybe fondant of chocolate with red wine jelly and saffron ice cream. The wine list is excellent. La Croix Blanche– Le Plantagenêt - 14km E of Saumur, Pl Plantagenêts, Fontevraud (02.41.51.71.11/www.hotel-croixblanche.com). Open May-Oct noon-2pm, 7-9pm daily. Nov-Apr 7-9pm Mon; noon- 2pm, 7-9pm Tue-Sat; noon-2pm Sun. €€€. This friendly inn in a prime spot opposite the entrance to the abbey covers the needs of all hungry punters by offering three eating options – a café serving all-day snacks and crêpes; the Fontaine d’Evraud brasserie; and the fabulous Le Plantagenêt restaurant where chef Hendrik Jansen van der Sligte concocts innovative dishes using what he calls ‘forgotten’ flowers, herbs, spices and root vegetables. On the plate this might translate as frog’s legs with garlic butter and a fricassée of Jerusalem artichokes, sea bream with lemon salt and crunchy purple carrots, or dried fruit risotto with Earl Grey tea and home-made ice-cream. L’Etape Gourmande - 25km NE of Chinon, La Giraudière, Villandry (02.47.50.08.60/www.letapegourmande.com). Open noon-2.30pm, 7.30-9pm daily. €€. This 17th-century farm’s idyllic pastoral setting – replete with black pigs, chickens, goats and fluffy bunnies – is reason alone to come here, but the backdrop is matched by the food and the friendly owners’ cheery welcome. Menus are great value, starting at €17 (for a main plus cheese or dessert) and ending at just €34.50 for what could turn into your most memorable four-course meal in the Loire. Starters might include succulent scallops with puy lentils, followed by rabbit in mustard sauce, goat’s cheese from a nearby farm and a Villandry – chocolate cake layered with biscuit, red fruits, white chocolate mousse and hot melted chocolate. 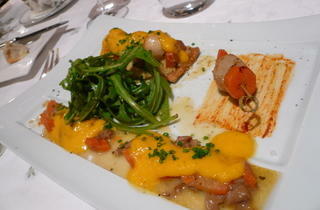 Le Favre d’Anne – Angers, 18 quai des Carmes (02.41.36.12.12/www.lefavredanne.fr). Open noon-2pm, 7-9.30pm, Tue-Sat. €€€€. In a prime spot overlooking the Maine river and Château d’Angers, this classy one Michelin-starred restaurant has a wonderfully original menu which might include the likes of fillet of beef with bacon and peanuts, fennel tatin with giant langoustines or strawberry and verbena vacherin. Chef Pascal Favre d’Anne takes great pride in using local produce but his heart lies in his native Haute Savoie, from where he ships in ripe reblochons and tommes. 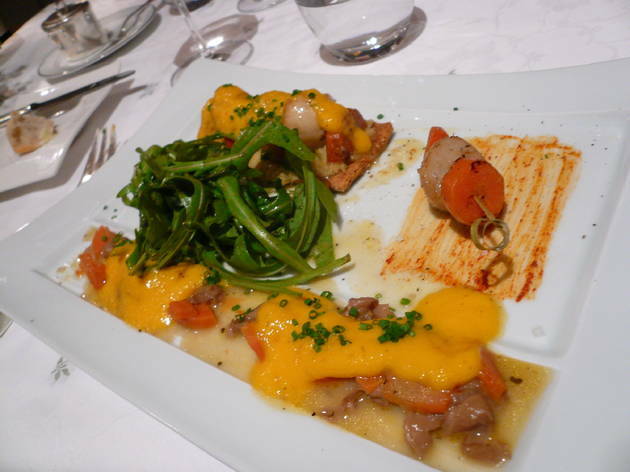 Les Ménestrels – Saumur, 11 rue Raspail (02.41.67.71.10/www.restaurant-les-menestrels.com). Open 7-9.30pm Mon; 12.15-1.30pm, 7-9.30pm Tue-Sat. €€€. It’s official: chef Christophe Hosselet is a culinary genius, inventing what could be some of the most flavoursome dishes in the region – rabbit and chorizo ravioli; succulent scallops with a delicious orange, artichoke and parmesan sauce; lobster consommé served with a straw; and a sinfully creamy profiterole stack. Wash it all down with a 2006 Saumur-Champigny from the Clos Cristal domaine. Le Prieuré - 3km W of Saumur, Chênhutte-les-Tuffeaux (02.41.67.90.14/www.grandesetapes.fr). Open noon-3pm, 7.15-9pm daily. €€€. The old Prieuré hotel, set high on a rocky spur, boasts some the best views in the Loire, overlooking the river’s sandy expanses and surrounding villages. Food is top notch too, served in a bottle-green 19th-century dining room by impeccable waiters in traditional black and white attire. Expect elaborate gourmet cuisine such as salad of rillauds with an egg poached in red wine, cod with mustardy potatoes and lobster cream, and gooey chocolate soufflé with a hint of citrus fruits. Le Relais Chenonceaux - 12km SE of Amboise, 10 rue du Docteur Bretonneau, Chenonceaux (02.47.23.98.11/www.chenonceaux.com). Open noon-2.30pm, 7-9pm daily. Closed mid Nov - earlyFeb. €. Great galettes filled to the brim with ham, cheese, egg and mushrooms, washed down with a glass of local wine, make this place a hit with locals and tourists alike. For something more substantial, the menu includes hearty steak-frites and moules-frites too. Don’t leave without saying hello to Charlie, the well-loved parrot in the courtyard outside. For restaurants outside Saumur and Angers (which are accessible by TGV from Paris) you will need a car. For your info Hotel-Restaurant le Prieuré closed this year.